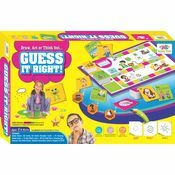 Why Let your kids get bored and turn into couch potatoes when you can engage them Constructively in this super fun Board game called " Guess it Right ". 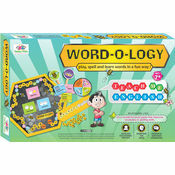 This Board Game consists of 162 game cards (54 each for dumb Charades, Drawing and Quiz mode). This Game is usually Played between 2 teams or individually up to 4 players. The Game cards have pictures of Animals, Birds, Insects, Nature, Elements, Vehicles, Professionals and helpers, Sportsmen and their equipment, eatables, Place, Houseold articles etc. These are Chosen carefully considering the age group and interest of kids. The task is to communicate the object shown in your card to your partner. If you are in Charades mode, you have to do it only through Actions. If you are in Drawing mode, you have to do so by sketching the object photo and if you are in quiz mode you have to communicate, it to your partner by giving clues and hints ( Provided in the card ). One the way try to collect maximum no of toy stars which are earned based on your performance in each round and mode of communication chosen.The Player or team to complete the game with maximum no of toy stars would be the winner and get the ,"Guess It Right-Champ" Toy Photo Frame.